Here, I’m trying to use travis-ci, c++, github, CATCH, premake together with my undoredo-cpp library to reduce entropy, try out continuous integration and behavior-style tests. As a “one-man show” programmer at least at home, I’m trying to keep the discipline of writing tests first. “Growing Object-Oriented Software Guided by Tests” is perhaps a good, although a comparatively dry book for those who are not yet convinced. 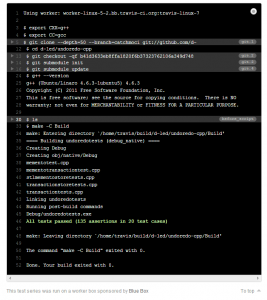 The blog post by Phil Nash about his latest version of the c++ single-header testing framework CATCH, moved me to finally get my hands on the free continuous integration service travis-ci, along with CATCH with a goal to rewrite the tests for my undo-redo c++ adventure in a more behavior-driven-style. 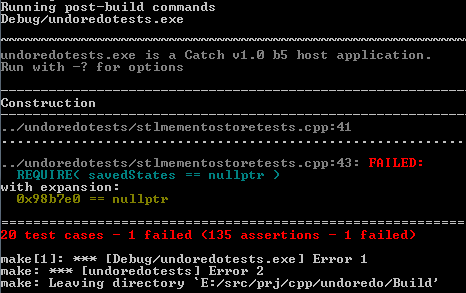 The undo-redo library is already there, and the tests as well – in gtest (see the master branch). I’d label them “explorative” at the moment since there are just too many assertions per test case, which means I’m repeating myself. Once the bulk of the assertions have been rewritten for CATCH, the build still failed due to an ambiguity in serializing std::nullptr_t. Fortunately, Phil has thought of (or rather tested) that, and has a macro which can be defined for the build, fixing it: CATCH_CONFIG_CPP11_NULLPTR. But! It’s not the end of the story! BDD! Mock-objects! 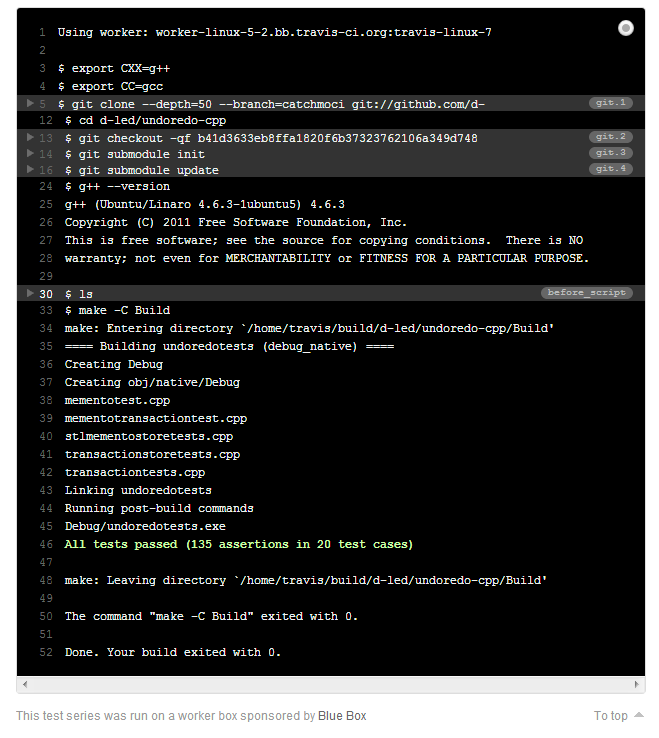 This entry was posted in C++, DLed, Lua, Programming and tagged .travis.yml, bdd, behavior-driven, catch, continuous integration, github, premake, programming, tdd, test-driven development, testing, travis, travis-ci on July 6, 2013 by DLed.